WARNING MAJOR SPOILER: Entire ‘MAN OF STEEL’ Plot Revealed? Comicbookmovie.com has posted an article they found from an AICN forum member that gives an entire, detailed synopsis of the new Zack Snyder Superman movie, MAN OF STEEL. Based on photos I’ve seen from the set, coupled with other rumors I’ve heard, this synopsis definitely sounds legit, but take it with a grain of salt, of course. I must say, though, if this IS what the movie is going to be, we are in for one hell of a flick!! Check out the synopsis after the jump. [UPDATE]: Our reader, Gabriel, has confirmed that this synopsis is fake and not the actual plot of the movie. It’s a fun read, regardless, but this is not the actual plot of the movie. It would be nice to see some of this incorporated into the film, though. We begin on Krypton. On a battlefield no less. Kryptonian troops try to break the lines of a rebel force that has holed up at a geothermal power plant. Jor-El is there, representing the Science Council. We learn that Kryptonian scientists have recently learned of another world in the galaxy that not only contains life, it contains human life. Having been told Jor-El’s yellow sun theory, Zod has set in motion a plan to leave Krypton behind with his followers for this new world, believing Krypton to be weak and corrupt. Jor-El manages to break through the lines and get into the power planet, where Zod is set to overload the station, which draws energy from the planet’s core (along with other stations across Krypton). He believes that this will start a chain reaction that will ultimately result in Krypton’s destruction. He is confronted by Jor-El who tries to convince him to abandon his crazy scheme but the two end up coming to blows. Zod is the better fighter and knocks Jor-El down and proceed to do what he went there to do. The army breaks through the lines though and manage to get in and stop Zod. As Zod is taken away, Jor-El looks over the readings coming from the planet’s core. We then have two scenes intercut with each other that show Jor-El at home with his wife and infant son, looking over core data while General Zod is sentenced to the “living death” of the Phantom Zone as his wife Faora watches from the shadows. The Phantom Zone is more like a wormhole than rotating glass and as Zod is pushed through the portal, his clothes burn away and bursts of energy begin to tear apart his skin. He screams in agony that it’s too late and that they will all burn as he will. At the El house, Jor-El comes to a startling realization. Zod wasn’t stopped in time. An emergency session of the Science Council is called for the next morning and Jor-El pleads his case, saying that Krypton is doomed and that they have no choice to evacuate the population to the newly discovered Earth. However the Science Council accuse Jor-El of being in collusion with Zod, suggesting that he’s trying to carry out Zod’s plan of leaving for a primitive world where he can rule as a god. Jor-El is taken away by security forces and placed under house arrest while the Council investigates him for treason. With all communication cut off, Jor-El can’t warn anyone what’s about to happen and is stuck in his home, awaiting his fate. We works in his lab, trying to find a way to at least save his wife and son and comes across a small deep space probe that he determines could be modified to hold a person – a child. He works day and night to modify the probe, fitting a Phantom Zone Generator that will allow the probe to travel between dimensions to reach the new world on the other side of the galaxy. On the day of Kryptons destruction, seismic activity is rising rapidly. Jor-El puts the final touches on the probe and prepares to send Kal-El into space. At the same time, Faora sneaks into a military base to steal a ship. With people panicking all over Kryptonopolis due to the earthquakes and eruption of the Gold Volcano, Faora is able to go unnoticed and make it to the ship. When she takes off however the ship is fired upon immediately. Faora pilots the ship into the atmosphere and out into space. Meanwhile Jor-El and Lara say goodbye to Kal-El in a heartbreaking moment. Finally the modified probe blasts away from the house and rises through the atmosphere as the planet tears itself apart below. The probe flies into deep space as the planet explodes behind it. Faora’s ship is caught in the blast and spins out of control. With the ship damaged, Faora attempts to set a course and then climbs inside a hibernation pod. Meanwhile, the probe activates the Phantom Zone generator and flies straight into the Phantom Zone. It emerges on the otherside, approaching a small blue planet. The new world – Earth. The probe flies into our atmosphere and crash lands in a cornfield. We then look through Kal-El’s eyes as the probe opens up and we catch our first glimpse of Martha Kent. Martha pulls Kal-El out of the ship, to the surprise of Jonathan Kent who is standing with his shotgun. He lowers the gun when he sees the child and they stand there looking at the baby and the alien space craft, wondering what the hell they should do. We then jump forward in time, 25 years later. We find ourselves on an oil rig with a bearded Clark Kent. He’s coming to the end of his shift when his boss calls him in for a chat. We find out that Clark is going under an assumed name and working undercover. Clark immediately goes into journalist mode, asking questions about working conditions but before the boss can respond there is a loud BOOM and everything starts to shake. The oil rig is on fire. The boss reaches for the radio immediately to call the coast guard and we see Clark trying to help people as everything falls down around them, but he’s trying to help without his powers being discovered. Eventually a rescue helicopter approaches but as people try to get to the landing pad, a crane topples over, threatening to crush them all. It never touches them though. The other workers are amazed to find Clark under the crane, lifting it up. The helicopter is able to land and the people are evacuated. Clark pushes the crane off into the sea and when the people turn back to look at him, he’s gone. We then jump to the streets of Smallville. Clark walks through town, backpack on his shoulder. He reaches the Kent Farm where he is greeted with hugs from his parents. He’s been gone a long time. We learn that he has been traveling the world, covering stories as a freelance journalist. There’s a letter from the editor of the Daily Planet in Metropolis waiting for him, offering him a job. Clark leaves for a shower and a shave, using the mirror to bounce his heat vision back on to his face. He goes to his bedroom to get dressed and sees his old glasses on the dresser. He puts them on, checking himself in the mirror and goes back to his parents who are surprised to see him with them, saying he hasn’t needed them since he learned to control his supervision. Clark says that they make him feel normal, flawed…human. He doesn’t really know what he is. He tells his parents of his travels, of how he tried to help people but that he never seemed to be able to do enough and that he wondered what the point of his powers were if he couldn’t save everybody. Jonathan asks if Clark can help out around the farm, maybe go with him into Smallville to pick up supplies, suggesting that it might help him clear his head. On the journey into town, Jonathan and Clark talk about his troubles and Jonathan mentions the ship which has been buried in the barn. Clark has always known it was there but was afraid to go near it, fearful of what he might discover about himself. Their conversation is cut short though as a storm blows through the town and with it, a massive tornado. Clark and Jonathan do their best to gather people up and bring them to the storm shelter in the church. There are still people outside though and Clark goes to try to help them. He exits the church and a gust of wind blows his glasses from his face. We then have a sequence of Clark speeding around Smallville, searching for people, saving people as he finds them. The tornado though is approaching the church. Clark heads straight for the tornado. The streets are now empty. For the first time, we see Clark fly as he takes off and flies right into the heart of the tornado, using powers like his superbreath to blow the tornado out like a flame. When the skies clear, there is a lot of damage but everyone is safe. Jonathan shows his pride in his son who picks up his glasses with a new determination. We go back to the Kent farm and into the barn where Clark digs up the ship. He’s not really sure what to do. Martha and Jonathan look on as Clark reaches out to touch the ship. His touch seems to activate something and the ship comes to life. The barn then transforms into Jor-El’s lab though only Clark sees it that way. Martha and Jonathan just see a barn. We are treated to a heartbreaking moment where we see Jor-El and Lara deliver their final message to their son. Clark sees his infant self in Lara’s arms. They are speaking in Kryptonese but the ship translates the language into English for Clark to hear. When the message is over, Clark is left in tears. He tells Martha and Jonathan of Lara’s final words, his purpose for being on Earth – to live and live well. He notices something in the ship and pulls it out. It’s Jor-El’s Councillor’s suit. He looks at the symbol on it. He knows what it means – Hope. He makes his decision. He knows what his purpose will be. Inside the ship, on a small display, the S Shield flickers as a beacon. Somewhere in space, inside the damaged ship, Faora awakens from stasis. She looks at a holographic screen and sees the S symbol. The symbol for hope. There’s another Kryptonian out there. On Earth. She now has a direct course to Earth and immediately activates the Phantom Zone generator, setting a course for the blue planet. We find ourselves in Metropolis at the Daily Planet. Perry White is there and he’s fuming. Clark Kent is nowhere to be seen. We also get our first look at Lois Lane. She tells Perry that he’s getting what he deserves for hiring freelancers. Clark shows up to put Lois in her place, scooping her on a story about a drugs ring operating in Suicide Slums. Lois complains that it was supposed to be her story and Perry reminds her that he assigned her to look into the “Metropolis miracles.” Lois tells him she has no time to write stories on angels or UFOs or people being mysteriously saved from certain doom. Perry reminds her that the Daily Planet isn’t what it used to be, with declining readership. Lois suggests giving Clark the Metropolis miracle story as he’s still new and he probably loves that human interest stuff. Much to Clark’s dismay, Perry agrees and Clark is forced to hand over the drug ring story to Lois. It’s clear from the very start that Lois and Clark are rivals not friends, at least not to begin with. The smug look on Lois’ face disappears however when Perry decides to team them up to cover the new Metropolis-Gotham rail link, being opened the next day. Perry calls it a chance for Lois to show the new guy the ropes, smirking as he says it. Lois is not pleased. We cut to space where we see Faora’s ship coming out of the Phantom Zone. It’s in our solar system, somewhere near Saturn. It spins through space towards Earth. The next morning, Lois and Clark are at Metropolis Central Station. This is the first time they really have a chance to learn anything about each other, the possible beginnings of a friendship. When the train arrives, it bears the LEXCORP logo on the side. Lois immediately pulls rank and declares that she’s going to go on the train for it’s first journey while Clark can stay behind to get the views from the people at the station. Clark is left interviewing people about what they think of the new high speed train as Lois takes her seat on the train, managing to bully her way through other people to sit beside the train’s designer, Emmet Vale, (future creator of Metallo, for the geeks out there) for an exclusive interview. Things seem to go smoothly at first as the train speeds up to optimum level, but much to the surprise and worry of the engineer, the train starts to move faster, speeding across Metropolis. Back at the station, Clark starts picking up radio chatter about the situation. Something is definitely wrong. He moves away from the crowd and disappears. On the train, the engineer is in panic mode. He can’t stop the train. He can’t even slow it down. A sudden explosion destroys the track in the distance. We then get the iconic shirt rip as Clark reveals his fathers suit, now his suit, and the big red S underneath. He then leaps out of his clothes revealing the full Superman costume and takes off at speed, chasing the train. His first job is to uncouple as many passenger cars as he can. He flies alongside the train, to the amazement of the people inside, using his heat vision to uncouple the cars. He manages to get a few and as the rest of the train speeds ahead, he flies ahead of the uncoupled cars and reaches out with his hands, using them as a bumper to slow the cars and bring them a stop. He then goes after the front of the train which as reached the gap created by the explosion. The train falls through the gap. Superman is there in a flash, underneath the train to catch it and level it as it reaches the ground. All of Metropolis watches as Superman brings the train to a complete and safe stop. For the first time, Superman has a chance to think and he looks around, floating in the air as people with camera phones get pictures and footage of him. He’s revealed to the world now. He uses his x-ray vision to look inside the cars to make sure everybody is OK. Lois emerges and gets a good look at him. There is a moment where Superman thinks she recognises him and Lois wonders herself but she shakes it off. She tries to say something but Superman takes off towards the broken pieces of track. It’s pretty damn obvious that this was sabotage. He flies high into the air above Metropolis and listens. At first we hear a thousand voices all speaking at once but he filters through them until he finds the voices of the perpetrators. On a rooftop looking over the crash site, the thugs responsible shuffle into a helicopter and take off, looking to make a hasty retreat. It isn’t long before Superman is hot on their tails. One of the thugs fires with an automatic rifle from the helicopter. The bullets just bounce off Superman and he keeps coming. One of the bullets though just misses and flies past him. Superman registers this immediately, stops and turns. He flies after the bullet and passes it by just before it can hit a woman on the street below. He catches the bullet, gives the woman a reassuring smile and takes off after the helicopter again. We have now seen that he is both faster than a speeding bullet and more powerful than a locomotive. Superman flies after the helicopter, getting in front of it and matching speed. Without even flinching, he sends his fist up through the spinning blades shattering them. The helicopter begins to fall out of the sky. Superman of course manages to capture it and bring it to rest in front of waiting police officers who are there to manage the train crash. 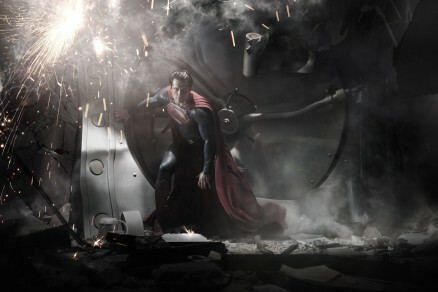 Superman opens the door and uses his heat vision to melt the guns into metal. Superman tells the cops that they are responsible for the train derailment and takes off before they can respond with both cops and thugs in stunned silence. Back at the train station, a janitor spots a set of clothes and a pair of glasses on the ground. He looks around, wondering who could have left them there. Shrugging, he goes to pick them up but a red and blue blur flies past and the clothes are gone in an instant. At the derailment site, Lois is on the phone to Perry while getting fidgety as the paramedics try to look her over. She promises to get back to the Planet to write up her account of the events straight away and as she hangs up the phone she spots Clark approaching, severely out of breath, saying he ran across town. She comments that it looks like she’s going to be writing the Metropolis miracle story after all, much to Clark’s frustration. Once again there is a moment where Clark fears that Lois might recognise him but he’s in the clear. We then find ourselves at a meeting of top military officials, including Lois’ father, General Sam Lane, discussing the appearance of the apparent savior as options are put on the table about developing military strategies to counter a potential threat. Later than night, Clark is in his apartment talking to his parents on the phone with the tv on in the background, showing footage of the events earlier in the day but also other events around the world. It seems Clark has been busy. His parents talk about how proud they are of him and ask about him being recognised. In space, Faora’s ship passes the moon and she can now see Earth in the distance. It’s the next morning and we are greeted to the front page of the Daily Planet – SAVED BY A SUPERMAN! Clark questions the name Lois has given the mysterious hero but Lois points out the big red S on his chest. When Clark asks how they know it’s an S, Perry chimes in asking what else it could be, and Clark drops the subject immediately, afraid of blowing his cover. Lois comments that the people responsible were from a criminal outfit called Intergang. Perry tells Clark to get out on the street and get some reaction from the public. Faora’s ship approaches Earth, severely damaged. It tumbles through the atmosphere, threatening to burn up as Faora tries to maintain control. She just about manages to level it off in time to crash on the outskirts of Smallville. She takes a small tracking device with her as she staggers out of the ship. She feels the yellow sun on her skin for the first time and spends a few seconds taking it in. The cuts on her face and arms from the crash begin to heal. Feeling her strength returning, she looks at the tracker, finding the direction she needs to go in and starts walking. She walks through Smallville, her alien clothes drawing strange looks. She doesn’t care. She’s focused on her mission. In Metropolis Superman flies overhead, drawing awed looks from the people below. He hears a woman screaming for help and reacts immediately, descending into an alley to confront an attacker. Back in Smallville, police and local news outlets have arrived at the crash site. As Faora continues through town she’s confronted by a cop. When the cop asks for ID she moves faster than she thought she could, knocking the cop backwards into a parked van. Amazed at her newfound strength, she glances at a nearby car. She picks it up without breaking a sweat and tosses it into a building. She starts to run, picking up tremendous speed and before she knows it she’s at the Kent Farm. Inside, Jonathan and Martha watch the events on the local news. Martha rushes to the phone to call Clark. Jonathan spots someone outside and gets his shotgun. He goes outside and sees Faora. He asks what she’s doing there. She says something to him in Kryptonese. He doesn’t understand. She spots the gun and her eyes start to burn. Jonathan recognises what’s about to happen and fires. The bullet bounces off her. Then a blast of heat vision destroys the gun and burns Jonathan badly. Martha rushes out to her husband. Faora glares at them then walks towards the barn. Martha has the phone in her hands. She starts dialling Clark. In the barn, Faora uncovers the ship. She opens up and reaches inside to a control panel. After inputting a commands she stands back and watches as a bright light envelops the barn and the Phantom Zone generator activates, creating a portal inside the barn. She waits as General Zod slowly climbs out, his body scarred and burned. She speaks to him in Kryptonese, telling him that the yellow sun will heal him and make him strong. She glances outside and sees Martha holding Jonathan while on the phone. She doesn’t understand what’s being said. She goes back to the ship and activates the database stored inside, effectively downloading Earth’s languages into her mind and the mind of Zod. In Metropolis, Clark is back in his normal clothes. His phone is ringing. He answers. His mother is frantic, talking about Jonathan being hurt. Even as he listens to his mother, his ears pick up the sound of a TV news program talking about aliens. His x ray vision penetrates a building, seeing through to a TV store on the other side where he sees images of the ship in Smallville. He has to get back and fast. At the Kent farm, Faora helps Zod out into the sun. She’s heard the conversation and understands the words. She thinks nothing of it but Zod reminds her of the ship. Another Kryptonian on Earth. Faora carries Zod out of the farm, leaving the Kents behind and speeds away, back to her own ship. The police are there. Faora swats them aside like flies and brings Zod into the ship. His wounds are healing but he doesn’t have his full strength. Faora shows him a BATTLE SUIT stored inside the ship. Superman arrives at the farm and sees that Jonathan is severely wounded. He says he’s going to take Jonathan to the hospital but Jonathan tells him to go after the Kryptonians and stop them from hurting anyone else. It’s a tough decision for Clark but Jonathan reassures him. Superman flies off at speed to the crash site. What follows is a battle that begins with Superman vs Faora. She speaks Kryptonese to him but he doesn’t seem to understand. So she speaks English, asking who he is. When it’s clear that he is not her ally she attacks him and they engage in battle. The military is also rolling into Smallville. As the battle rages on the street, Zod emerges from the ship in his battle suit and joins the battle. Superman is stronger than both of them at this point and manages to break through the battle armor. At the same time, the small military force is attacking the aliens and Superman ends up having to protect them. With Zod’s battle suit destroyed, he removes it and takes Superman on hand to hand. But he isn’t strong enough yet and Superman is clearly winning the battle. Seeing how much Superman seems to care about protecting civilians she causes a fire with her heat vision that threatens to rage through the town. With Superman distracted, she grabs Zod and takes off. Zod tells her to destroy the ship as they fly over the crash site. By the time Superman is done dealing with the fire, the other Kryptonians are gone. Superman rushes back to the farm. Martha is in tears. Jonathan is clearly dying. Superman doesn’t know what to do but Jonathan tells him its alright and that he’s proud of the man he’s become. He then passes away in the arms of his wife and son. General Lane appears at the crash site which has now been secured by the military. The ship is now nothing but debris. Lane orders that the pieces be gathered up for study so that they might know their enemy. Later on, we find Zod and Faora hiding in the mountains. Zod is getting his full strength back. He notices that Faora may be as powerful as he is and feels threatened by it. Lois Lane arrives in Smallville the next morning. She first goes to the crash site, hoping to get some information from her father but he turns her away though not before suggesting that Superman may have been the vanguard for an invasion. Lois defends Superman, stating that he was fighting the aliens and protecting the people. Then she visits the Kent farm where Clark and Martha are grieving. She introduces herself to Martha and offers her condolences, asking Clark why the alien would be there. Clark responds that the aliens didn’t care who they hurt, doing his best not to reveal the whole truth. Martha offers to let Lois stay at the house while she’s in town. Clark busies himself working on the farm as Lois tries to comfort him and their friendship blossoms for the first time. In the mountains, Zod pours over information gathered about Superman. Not wanting a rival for the world he decides it’s better to take care of Superman sooner rather than later and will go to Metropolis, where Superman has been active the most and draw him out. He’s also beginning to see Faora as a rival an even though she’s his wife, he blames her for him being trapped in the Phantom Zone for so long and kills her without hesitation. He will have no rivals. Lois reluctantly says she has to go back to Metropolis but she will stay for the funeral if Clark needs her to. Clark tells her its alright and that he’ll see her in a few days. Lois leaves and Clark and Martha prepare for the funeral. In the mountains, Zod is busy preparing himself, mastering his new abilities. General Lane has gone to Metropolis to set up base, knowing that this is where he’s most likely to encounter Superman and perhaps the other aliens as well. Martha, Clark and others from Smallville attend the funerals of Jonathan and others killed in the alien attack. When the funeral is over there is a small wake at the Kent farm. In Metropolis, Zod makes his appearance, flying into the city and announcing himself by picking off a few cars with his heat vision. Then he waits. The military is mobilized immediately and at the farm, Clark sees the broadcast of the events on TV. He springs into action immediately, making excuses before disappearing out the backdoor. He’s in the sky, speeding towards Metropolis. A full scale military assault on Zod is taking place in Metropolis. From tanks to fighter jets, the streets of Metropolis have become a war zone. Lois is of course right in the middle of it. She spots a young photographer, barely out of school, who like her isn’t running away like the rest of the people. She asks who he’s working for and he says nobody. He just thinks he can get some cool shots. Lois offers him a job which he accepts on the spot. He introduces himself as Jimmy Olsen but Lois is too preoccupied to care. She drags Jimmy into the heart of the battlefield as the military fire countless rounds of activity at Zod who doesn’t even flinch and retaliates with devastating force. Superman arrives on the scene to save the military personnel from annihilation and then confronts Zod. At the command center, General Lane gives orders to fire on both aliens. Zod and Superman have a brief conversation. Zod recognises him as Kal-El, who he once held in his arms as an infant. Superman knows very little about Zod but he knows enough to declare that the General destroyed Krypton, something Zod seems proud of. Their fight is epic. Kryptonian against Kryptonian on the streets and in the skies of Metropolis. While Superman has the experience with the powers, Zod has the advantage in combat training. They appear well matched. Even as they fight, the military continues to fire on both of them. Seeing this, Lois rushes to the command center, leaving Jimmy to get some great shots of the battle. Lois manages to get in to see her father, trying to convince him that Superman is on their side and to give him a chance to stop Zod. General Lane eventually relents and puts his faith in Superman. The battle continues but Zod is now exploiting Superman’s clear witness, targeting civilians to distract him. Superman knows he has to get the battle away from the city and has to deal with Zod once and for all. So he flies into the air and blasts away from Metropolis with Zod in hot pursuit. They continue their fight as they fly west towards Kansas, back to Smallville, eventually reaching the Kent farm. Troops left behind at the crash site spot them flying by but the two are gone before anything can be done. Superman gets to the farm first. The wake is over and it’s just Martha. Superman tells her to get away quickly. When Zod arrives there’s nobody in sight. He threatens to burn the whole place down and then uses his x-ray vision to scan the area. He spots Superman in the barn and rips the door off. Superman rushes to the small probe that brought him to Earth and activates the Phantom Zone generator. Realizing what Superman has in mind, Zod rushes him. It’s a battle of wills as the portal to the Phantom Zone opens, threatening to pull them both in. Zod seems to have the upper hand at first but Superman eventually overpowers him and throws him into the Phantom Zone. Exhausted, Superman rushes to the ship and turns off the generator. He then falls to his knees, unsure of what to do. Time passes and Martha appears at the barn. Superman tells her it’s alright. That it’s over. Martha hugs her son and Clark tells her to stand back, that he’s going to destroy the ship. Martha though says that it’s the only thing he has with any kind of record of where he came from. So Superman decides to put it somewhere it will never be found, mentioning a place he found in the Arctic. A few days later, General Lane sits in his office. He has some of the debris from the crashed ship on the table and he’s talking about it on the phone. He says there’s not much left. Bits of metal and some pieces of green rock fused into it. We see the person on the other end of the call asking for General Lane to send it over to him. It’s none other than Lex Luthor, sitting in his office over looking Metropolis. Metropolis is slowly getting back on its feet. The clean up of the battlezone has started. Clark arrives and is immediately confronted by Jimmy Olsen who introduces himself enthusiastically as a new staff photographer. Perry offers his condolences for the death of his father and Lois asks if he’s OK. He replies in the affirmative and is ready to get to work. He then asks if there’s been any word from Superman. Lois replies that it seems both Superman and Zod have just disappeared. The military is still on high alert but it seems the public have taken to Superman as their hero and protector. Lois just wishes he would show himself. Frustrated, she decides to go up onto the roof to get some air. Lois stands on the rooftop, looking across Metropolis. She turns and is startled to see Superman hovering in front of her. He tells her that Zod is back where he belongs and hands her a letter, addressed to the people of Metropolis and the world, informing her that he wants people to trust him and the letter will explain everything they need to know about him. He prepares to fly off and Lois calls him Kal-El, having heard it during the battle. Superman smiles and says she can call him Superman. It seems to have caught on. He then points out that he does have a big red S on his chest after all, echoing Lois’ words to Clark, which makes her think for a moment. She asks what the symbol actually means and he tells her that it means hope. Lois can’t help but smile and she watches as Superman flies off. We follow him over Metropolis as the people below watch in wonder. He picks up the sound of someone in trouble, turns in the air and flies to where he’s needed. Credits. Sounds like it would be a good film. An action set piece every ten minutes and a decent amount of drama. The big Smallville set photos seem to match up the action but still no casting news on a General Lane or Lex Luthor. No word on Christopher Meloni's character, Colonel Hardy, though. So that leaves me to draw three different conclusions: a this synopsis is fake, b it's outdated, or c Meloni's character is actually Lex Luthor. Then, however, Richard Schiff was cast as Dr hamilton (who is never even mentioned int this synopsis, UNLESS they are replacing Emmet Vale with Hamilton... but since in a recent interview with Schiff, he said he had a scene with Superman and that his character was "very passionate about his job", I'm guesing this synopsis is fake. Or extremely outadted, which would be the same thing anyway. Doesn't anyone feel they ripped off Doctor Who with that version of the origins story? Other than that it seems alright enough, if a bit too convoluted.